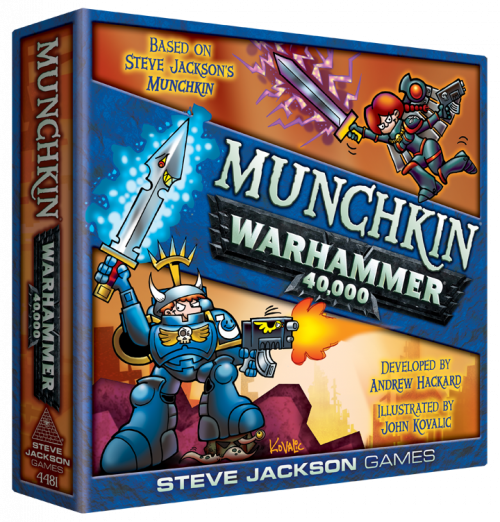 Daily Illuminator: Munchkin Warhammer 40,000 Is At Print! October 17, 2018: Munchkin Warhammer 40,000 Is At Print! We're pleased to announce that after several internal editorial passes, a pre-mortem meeting, and sending the files to Games Workshop for approval, Munchkin Warhammer 40,000 is at print. (In fact, we sent it off a couple of weeks ago; we've had so much news to share that this is the first chance we've had to mention it.) This is a major accomplishment and I want to thank the whole team here for making this happen. Special thanks are due to Alain Dawson, our liaison with Games Workshop and all our licensors and licensees; Alex Fernandez, who did a whole lot of work in a short period of time to make this game happen; and (of course) John Kovalic, for his translation of the grimdark Warhammer 40,000 art into his Munchkin style. I also want to thank the Games Workshop team for being fantastic partners on this game; I couldn't have gotten it done without your support and advice. Our printer took our files and turned them into digital proofs, which we reviewed to see if anything got horribly broken in the file transfer. (Nope!) The next step is for them to create handmade tooling samples that get shipped to the Austin office for us to look at and admire. (There will be pictures!) Assuming everything is OK, the factory will send production samples, which are actual games pulled off the production line, for us to review. After we approve those, they run the rest of the print run, put it into cartons and onto a container ship, and it starts working its way over to us, in time for a March 2019 release. Meanwhile, we're doing exactly the same thing with Faith and Firepower (May 2019) and Sorcery and Savagery (July 2019), staggered by a couple of months for each. We'll let you know as each of these expansions goes to print so you can follow along on your own calendar!